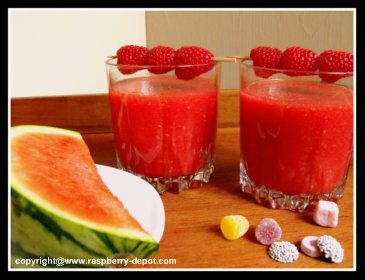 Make this Watermelon Raspberry Slush Recipe, it's so quick and easy and LOW FAT too! If you are planning to make this treat for more than two people, you can easily double or triple this amazing recipe. 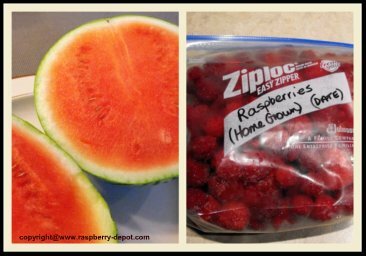 The seeds of the raspberries are included ... but that is good, because the seeds are healthy! Immediately pour into glasses and serve. Now that's BERRY FRESH! ... and BERRY EASY! Perhaps you are interested in owning your own Slushy Maker Machine? Check out these Great Models below, available for purchase online at *Amazon.com. Slushie, or "Snow Cone Machines" are excellent gifts for kids too! I remember with fondness the sno cone machine I received for my birthday when I was a child. I absolutely loved to treat my siblings and parents, and anyone who was interested in a refreshing frozen fruit drink! Consider a snow cone machine as a gift for your son/grandson or your daughter/granddaughter. Whether it be a Birthday Gift or a Christmas gift, it will provide hours of enjoyment for the special little people in your family. This is also a great way to encourage youngsters to drink their fruit juice. You can use natural fruit juice or syrup for the slushies, or you can purchase different flavours of syrup.